Anyway, Aunty Maria's mee rebus is good (Thanks for the lovely meal! ), I tell you, and I shamelessly had two helpings (Kerp, I ate up your share!). There was of course alot of yakkings, and Elviza even said: "You learn alot of things sitting here and listening. And when they run out of things to say, they share recipes. Seriously!" And you guys would never believe what I got to touch today...The Olympic Torch! Go eat your hearts out people...Aunty MarinaM, one of the bearers of the torch graciously brought the torch with her, and I got to raba the torch, you know! 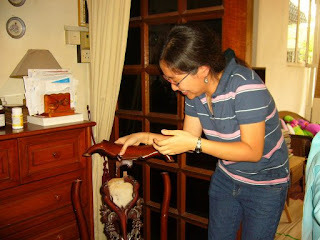 And Daphne being Daphne, she managed to 'break' a chair in Aunty Maria's house...I was trying to lift a chair when all of a sudden, the entire handle came off, and dear Rikey had his camera ready and caught me in the act of trying to put it back...Turns out the chair memang rosak adi, but they didn't tell me! Aunty Marina even said: "Ah Daphne, how to go to Canada? You leave a trail of destruction wherever you go!" 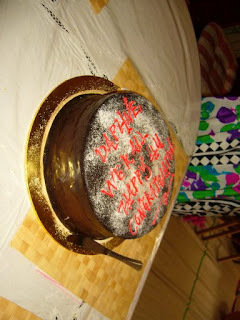 Chocolate Indulgence Cake...It reads: "Daphne, We're all happy 4u. Congratulations!" Aww shucks guys (Aunty Dalilah, special mention to you)...Thanks alot! Awww, maaaan. I wish I was there you know...I hope I see your art of destruction LIVE you know hehehe. Haha, I was thinking how strong you had to be to break that chair! Mee Rebus Tuesday is a nice concept...I should try to get the Malaysians over here to do something like that. Is it every Tuesday or what? uv got to break something dont u daphne? :P jk. jgn marah. nanti kena jual! Glad you finally made it to MRT. Anyway, hope too see you again before you fly off to Canada. i missed it big time, didnt i? if only i knew the torch would be making its way @aunty maria's i would have gathered some little strength that was left in me and find my way there, which was mere 5 minutes away! see? the fever took a serious turn i was totally knocked out. *i think uncle B's phone is out of order. couldnt get through since morning. Lucky you. All the stars are there except for kerp. Poor kerp, he must have wished that that fever came abit later than the MRT day. He was so near and yet so far. I would trade my hairs to be there. Lets have a small gathering in Ipoh before you fly away to Canada. Wanna meet Che'gu Nazir there too. Thank you for blogging about the latest MRT. Every person sees it differently from their perspective. You have a great post written the Daph way. Immensely enjoyed it. Hawwo nai nai.. haha.. so this was the torch you were talking about???? 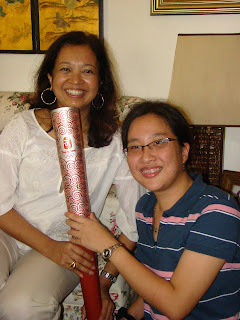 When you told me you got to hold the Olympic torch I thought you went out for the 'run' thingy and sort of ermm.. touched it while it was on its way..
Hehe.. I was thinking.. oh my god.. since when daphne become so jakun liau?? Then I thought maybe it was because you were going to Canada already - so, last chance! I'm missing baby the cat for some reason.. its been so long but I still remember the way he feels around my legs.. He must be missing me too! Hehe..
Nice meeting you again, Daphne and best of luck in your studies. Anyway, yes, this MRT thingy is every Tuesday, in Aunty Maria's house...And yes, you should start one of your own! No, no, tak marah...It was quite funny lar, although terkejut gua when it happened! At least, I won't confuse my father anymore by making him think I've got a friend called 'Guppy'! You should have seen his face man! Hope to see you again too before I fly...Will keep fingers crossed. I think the most important, significant, eagerly awaited question that would bring the whole nation up in hurrahs, clapping, grasping and sighing...is...'how's the mee rebus la Daph?'. Hehe...just joking Daph. But its nice to see you alongside others famously-bloggers. More so, to see the smile on your face, and their too. Glad you enjoyed this version! I am, after all, the Queen of Drama...Sampai people's chair pun I musnahkan! Once again, thank you for the lovely brooch and cake! 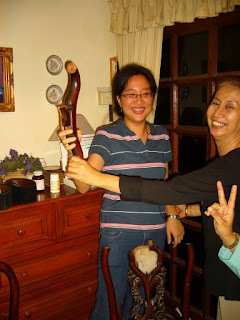 I really thought you brought a buah tangan for Aunty Maria, or that maybe, somebody was having a birthday! Hope to see you around before I leave...Till then, take care! Eh, the mee rebus was good lar...Although it was not the mee rebus I'm biasa with (the Northern style), and I would have called it mee kari if I wasn't told it was mee rebus! Hehe...i thought some thing good must have been added to the mee rebus when u 'ahem' the chair..haha. That is what i call a candid camera moment. Thanks for sharing ur day with us. 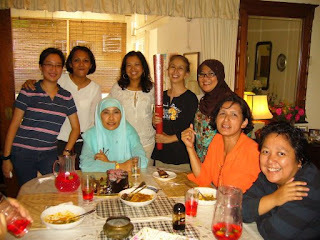 To have a good makan, in good company..and to touch a torch!!!! So glad u had a good time..I'm sure everyone did! A-ah, Pi.. Daphne ni pandai, pandai amik hati... he..
By the way, it was my pleasure sharing the day with you! Yep, I'm lucky and I figure everyone had a good time too! Actually, I think they have a good time every week, otherwise they won't keep going the next week and so on, right? But yeah, got the torch! I memang kaki call everybody Unker...Hehe...I don't call people Abang as a rule (Kak is ok) cos it sounds sooo...manja? Ooii, syok nye you guys!